Federal employee unions saw an uptick in membership after the government shutdown, and the number of members has been growing consistently over the last several years. The American Federation of Government Employees, the largest federal employee union, gained about 1,100 members in November, after suffering a net membership loss during the shutdown itself. Overall, AFGE has 284,715 active, dues-paying members, the largest its rolls have been in more than 50 years. 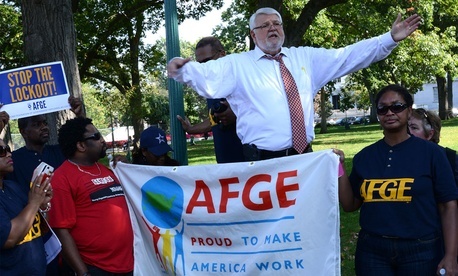 In 2000, AFGE had fewer than 200,000 members, and it has netted 58,000 in the last seven years. The National Federation of Federal Employees also has seen a “small spike” in membership after the shutdown, enrolling more people in October than in the previous two months combined. NFFE attributed its recent success to its activism in getting the government reopened as well. Halunen added NFFE, the oldest federal employee union in the country, has seen a net membership increase each of the last five years. The union growth comes despite a decrease in the size of the federal workforce in recent years. Federal agencies have shed 92,000 jobs in the last 12 months, largely due to sequestration, an increasing number of federal retirements, more buyouts and hiring freezes. In the early 1990s, Uncle Sam employed about 5 million civilian and military personnel, though today that number is just 4.3 million. The contractor workforce has, however, grown dramatically in recent years. Since 2001, the federal government has more than doubled the amount it spends on contractors, according to the Project on Government Oversight.